As much as I love wildlife of all kinds, one of the things that I really disliked about my native home state of Texas was the number of bugs. You DID NOT want to go outside at night because you would have to turn an outdoor light on, and that meant you would be walking out into billions and billions and billions of flying bugs. I know we have nighttime flying bugs here in San Diego, but I think they go to sleep at night just like I do. And ants! I hated ants. Especially fire ants. I remember one time when I went with a friend to Lake Houston to go sailing on his brand new sailboat. Out in the middle of the lake we jumped in to go swimming….. right into a bunch of fire ants! IN THE MIDDLE OF THE LAKE! That day ruined me forever on going sailing and going to Lake Houston. 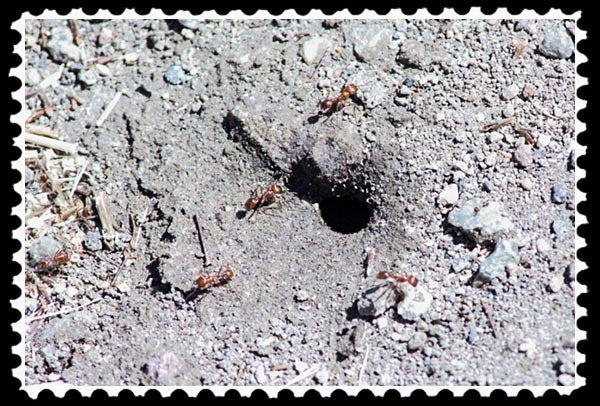 The last time I saw an ant colony here in San Diego was July 6, 2009. You’re laughing, aren’t you? You think me knowing the date is funny. I know the date because I took a picture, and the metadata tells me that I took it on July 6, 2009. Now you’re laughing because I took a picture…. Should I talk about roaches? Ack! When I moved to Houston in 1977 after graduating from Texas A&M University, my first apartment was next to a bayou. Add in lots of palm trees, and it was roach city. My roommates and I used to cook greasy food each night, collecting the grease in bowls and cans to spread around the apartment. Then and only then could we get a good night’s sleep because the roaches would go after the grease, climb in the bowl, get stuck and drown. The next morning, those bowls had 20 or 30 roaches in each of them. We only stayed there three months, and those three months ruined me forever on living near lakes, rivers, streams, and palm trees in Houston. I can count on one hand the number of roaches I have seen in 21½ years in San Diego. Then we come to spiders. I love spiders. Except daddy longlegs. For some reason, I find daddy longlegs to be creepy. My wise old grandmother, though, taught me an appreciation for all wildlife, explaining to me the food chain, so when I find spiders inside that don’t belong inside, I shoo them back outside. Hmmm. Some day I’ll have to let Julian video me shooing a spider back outdoors. That video probably would go viral…. The spider I miss, though, is the big garden spider, the one that builds a huge, beautiful orb web at night so that when you go to get the paper in the morning, you walk into a huge web, forgetting about the paper while running yelling to the shower. I have never seen a garden spider here in Southern California…. WAIT! I lie. I saw one in Pacific Beach last weekend! I was so excited that people were rushing over to where I was taking pictures to see what was going on. I’m pretty sure most of them all of them thought I was weird. Nonetheless…. Following is Photographic Art of my beautiful garden spider. You may tell me in a comment how beautiful it is…. 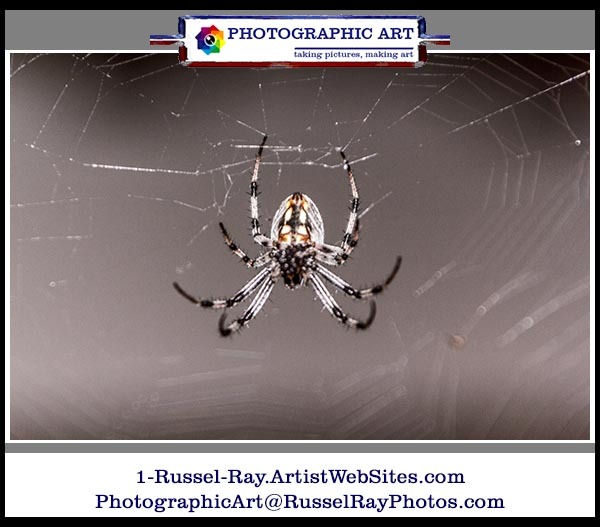 This entry was posted in Fauna, Nature, Photographic Art, Photographic Art @ Fine Art America, Picture of the Moment and tagged ants, garden spider, roaches on August 30, 2014 by Russel Ray Photos. I KEENLY look forward to seeing this spider-shooing video! And yes, that spider is exquisitely dashing, what a beauty, indeed! I would have been doing cartwheels whilst photographing this fellow right alongside you. You just won the Russel Ray Photos award for bestest comment of the century! You can imagine the looks I received when I squealed and fell to the ground to photograph a seascape shot with a sharp shot of a crab arm in the foreground a couple weeks ago. I thought it was beautiful…. It’s kinda poetic ain’t it Russel? Okay, just ONE last blather since you’ve got me all excited with this post. Some months ago a crowd gathered, wondering why on earth I was skipping around on the rocks, ignoring the glorious sunset spooning liquid gold sunlight into the silken waters that lapped against the bed of limestone I was cavorting upon (I don’t know how I manage not to ding up the camera whilst engaging in these acrobatics), snapping away at the rocks, ignoring the glory. They could not discover what on earth it was that was so exquisitely fascinating and worthy of photographing that it rendered the sunset a mundane and blase subject to me, so one person in the crowd trotted up to inquire. “RATS! LOOK there goes one now, isn’t he the cute! They must be engaging in some kind of mating game to be this excited, running around all over the place like this!” I squealed with sheer delight, snapping about a thousand photos as the darling rodent gamboled by. You can imagine the reactions. I am surprised there wasn’t a near-drowning in the haste to escape the rocks, the sunset, forgotten. I need to come visit you so you can take me on a photography expedition, although I fear we might never return………..
SirFelion has been inactive in the blogging world for the whole summer. He finally published a blog post on August 10. I’ve been following him for quite some time, but he really does need to come in from outside and publish some stuff on his blog for me to ogle. Get on him! On it indeed! He writes superb posts and I am always wanting to see more meself! P.S. I worked in Tampa from April to October 1994. The company rented me an apartment at Rocky Point, which has a lot of channels, always full of manatees. They were the coolest and friendliest creatures. Sadly, I lost all of my Tampa pictures in the Great Hard Drive Crash of August 2005. Oh NO you experienced a Great Hard Drive Crash as well? I just experienced my first one a few months ago. I almost quit photography…almost. I lost well over a terabyte of work, years’ worth. I wailed and wailed. But then, I suddenly remembered that Florida was still right out the door waiting to be photographed and I found meself dashing off, once more, unto the breach. I am sorry you too know this pain…all those lovely manatee photos…oh dear! Another P.S. Tampa is beautiful I must say. There is a fantastic little rehabilitation aquarium there in Clearwater that I would adore volunteering at. The film “Dolphin Tale” was filmed there, about the real dolphin Winter, who lost her tail via fishing net. Er, ahem, I do not recommend this film to you, however….but the aquarium is very groovy. Grinning with you. Marvelous we can share this same outlook! Best way to consider it, I think!! Cheers!!! I am under a similar system- using Excel as well. Astounding, I thought I was the only one 😉 But how else can one manage all the thousands of blogs? I follow over a thousand right now…and keep discovering new ones I “absolutely love” and so…more to add to the spreadsheet. I am not so efficient. I visit about 30 a day, if I happen to get online. You inspire me to improve upon this. Anyhow, this comment-barrage is finally ending as I must dash off as I have a meeting with some sharks this morning and the dawn is just beginning to pinch the sky. Thank you in advance for visiting, I hope it is a pleasant one! Cheers! You’re up to #9 now. Looks like I’ll be by sometime today! Yes, Russel, your spider is beautiful. They are wonderful creatures, and as you probably know by reading Colltales even occasionally, I often write about them. It’s all part of my lifelong therapy dealing with my extreme arachnophobia, which as you know, it’s a mix of fascination and horror (I’ll just pretend that you haven’t mentioned anything about getting caught on their web while picking up the paper, etc.). Since I simply can’t get near them, I’ve really learned a lot about them, and the more I know, the more I’m in absolute awe of them, which is really the point, isn’t it? Thanks for that. Some insects really bug me as well. We will have hornet, wasp, yellow jacket summers occasionally which absolutely dampens zesl to bbq or even eat outside. Our house eaves are decorated with stylish yellow jacket traps. I inspected a house a few weeks ago that must have had 50 or more wasp nests under the roof eaves, all around the house. Surprisingly, my Clients had not noticed them. I always point them out because if nearby windows are open, it could be a mess, especially if a children’s room. Yes, it is a beautiful spider! Aren’t you glad you left Texas for California? The insect population hasn’t changed much.. And I had not thought about Lake Houston in years. I used to go water skiing there eons ago. I learned to water ski on Lake Houston. Then that nasty seaweed-like stuff invaded the lake, making skiing difficult if not impossible. It got so bad that one summer, probably ’83, the stuff got all wrapped around the propeller and shut the boat down. We had to be rescued by the lake police. Ugh! I don’t like bugs either. We don’t have many where we live, but there are plenty in Mexico where we spend a lot of time and I could do without them, thank you. I agree with you wholeheartedly about the bugs. That is one of the main reasons why I haven’t moved the snowy alps of Cleveland! I do not care how you try to spruce up the name….a palmetto bug…is still a flying roach! The praying (preying) mantis? We had billions of them in Texas, but I’ve never seen one in California outside of the San Diego Zoo. We have them here! They are cool, and brutal too! Oh snap, look at that…sorry, the crowds were right, you are weird. I am not a fan of spiders, any kind. Big, small, hairy or bald, they are all on my “scream like a crazy person when one is on me” list. Being from Alberta, we have our share of bugs. This summer was so hot the mosquito’s were hardly noticeable but now the wasps are around in fall because they like it cool. They’re a menace and will ruin any el fresco meals you may attempt on the patio. We’re lucky to not deal with too many of the warm climate nasty’s but did have roaches in our B&B in Maui. Very little sleeping went on the first night, then they came in and used some natural spray. Don’t know if we’ll go back to that place. You would hate my office! Every spring for the past few years it’s been infested with flying ants–a creepy combination of two things you can’t stand! I don’t like them much either and examine my work bag for stowaways at the end of every day. The last thing I want to do is bring a few home with me. I’m sure to a lady garden spider he’s really hot.